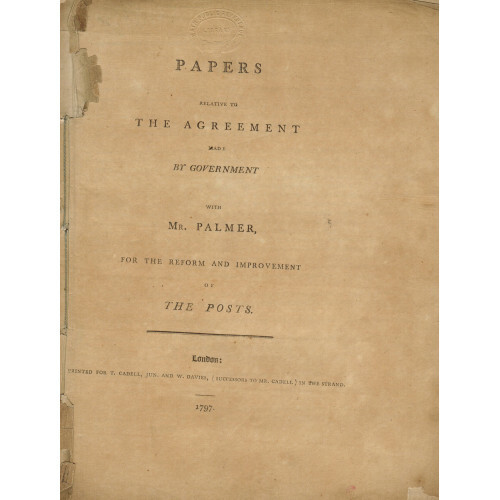 Papers Relative to the Agreement made by Government with Mr. Palmer, for the Reform and Improvement of the Posts. COACHING. JOHN PALMER OF BATH. The foreword is signed by John Palmer. John Palmer [1742-1818] suggested the postal service could be improved by using mail coaches. He was appointed Comptroller General of the Post Office in 1786. The experiment was a great success improving the speed of the mail. Revenue was greatly increased but there was a delay in his share being paid. Eventually he was paid a substantial amount but he still claimed it was not the full share agreed. This publication presumably instigated by Palmer was part of his campaign to get the full sum he thought he was owed. 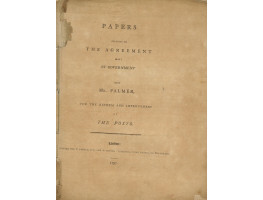 Palmer's claim for recompense was not met fully, but in 1813 (53 Geo. III, c. 157) an award of some 50,000 was made. Publication 1st edit., Printed for T. Cadell, Jun. and W. Davies (Successors to Mr. Cadell) in the Strand, 1797. ESTC T5301 From the Postal History Library of Donald R. Hunt with his label on front cover of blue wrapper, given to Bath Public Reference Library.